Pictured Front Row (L-R): Matt St.Denis, Brian Ramirez, Eric Paez, Ryan Maguire, Andrew Lasso, Roman Arrieta, Tyler Arnold, Sam LaTorre, Greg King, and Eric Ormsby. 2nd row (L-R): Coach Creeden, Spencer Tencza, Will Chester, Dakota Striso, Carlos Figueroa, Jack Makoujy, John Kern, Coach Van Pelt, and Coach Emmerich. Back row (L-R): Coach Pink, Andrew Bilezikian, Matt Randazzo, Ian Roeloffs, Paddy Guilfoyle, Will Brack, Blas Freshko, Evan Liquori, Matt Stevens and Coach Brief. Congratulations to the Warwick Valley Central High School Boys Varsity Soccer team, who earned its 9th consecutive Division title! 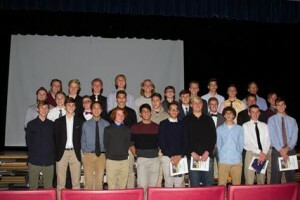 The team celebrated its 14-4 season at its annual end-of-year banquet. 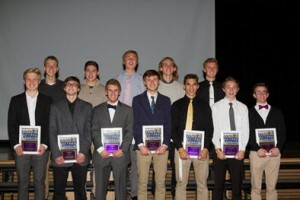 The team also bid a fond farewell to the senior players: Andrew Bilezikian, Will Brack, John Kern, Jack Makoujy, Dakota Striso, Spencer Tencza, Will Chester, Blas Freshko, Carlos Figueroa, Ian Roeloffs, Paddy Guilfoyle, and Matt Randazzo.